The complete versatile and unique system for construction applications with hinged side wings des..
2m Gate Barrier Moulded from high impact HDPE for impact strength and durability to last up to .. Replacement barrier foot for either Gate Barrier Olympic Barrier Master Barrier .. The JSP Titan barrier is made using precision injection moulded construction, with central struts.. The Road Rock is a multifunctional base and the first product of its kind that will allow a temporar.. The main function of our temporary road barriers is to protect traffic and pedestrians from potential safety hazards when a section of the road is closed. Their distinguishing feature is that they can be relocated as conditions change in the road works. Barriers are composed of high density plastics that are easily put into place when and where needed. Another advantage is that they can be assembled without having to use any heavy lifting equipment. Olympic barriers - Olympic barriers can be rotated and locked into place every 90°, allowing use as both linear (linear meaning they can be linked together to form a longitudinal barricade) and box barriers (box structures of different sizes can be used to secure small areas.). Linking clips slide into place to ensure complete stability on uneven surfaces. Gate Barriers - Moulded from high impact HDPE (High Density Polyethylene‎) for impact resistance, HDPE can last up to six times longer than other standard PVC barriers. The gate barrier also contains two built in thermoplastic feet that can swivel on their pivots, and a reflective top-surface, which increases its visibility to road users. 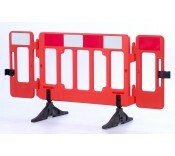 JSP Titan barriers - These barriers contain a linking function, allowing them to be easily joined together. Swivel feet are also attached to the barrier, assuring stability in diverse weather conditions, with central struts giving additional support. Barrier replacement feet - Replacement barrier feet that are suitable for our Olympic & Gate barriers. Additionally, barriers are easy to stack; therefore it is possible to stack 40 barriers together on a single pallet.